My favorite thrift store has a section dedicated to seasonal items. A couple of days ago on one of my visits, I noticed 2 entire clothing racks filled with Halloween costumes and/or clothing items. The number and variety of Halloween items in this thrift store surprised me. How this holiday has changed since I was a child in the 1950’s, and even since I raised my own sons in the 1970’s/80’s! According to some reports, it has become North America’s second biggest holiday (read that as second most commercialized and expensive). 2015 estimates of amount spent per house hold is around $70 – $75 dollars. Although for years, Canadians were outspent on this holiday by Americans, they have now (according to the Financial Post) overtaken the race. Adults are spending money on more than just costumes for their kids and treats for the neighborhood tricksters too. From attending costume parties to converting their home or yard into the scariest place in the neighborhood, they are causing part of the surge in Halloween spending. Even the dogs are getting into the act. I saw little Mexican hats in Walmart the other day – part of a dog’s Halloween costume! The National Retail Federation indicated that spending on pet costumes was around 350 million dollars in 2014 and is rising at the rate of 59% since 2010. My spouse and I grew up in different St. Louis suburbs but had similar experiences with Halloween. Decorations were usually either home made or paper with the exception of one carved pumpkin. Now decorations range from creating entire ‘haunted’ garages to carving scads of pumpkins from your trip to the local pumpkin farm (to which admission is charged, rides to spend on are available and of course food and drink consumes funds as well). Trick or treating in the 50’s was bounded by a 2 or 3 block range of neighbor’s (whom we knew) homes. Pillow cases or tiny paper mache jack-o-lantern’s were the treat receptacle of choice. Costumes were typically home made but sometimes came from the dime store. Treats were mainly home made or low key – pop corn balls, cookies, apples or pennies. Now kids expect high quality (high dollar) individually wrapped chocolates and specially decorated, store bought treat bags and costumes from the latest movie. In my neighborhood, it was actually trick AND treat. Kids were invited into the home and expected to sing a song, tell a joke or some other ‘trick’, in order to receive their treat. Now it seems to be mostly about quantity – how fast can we hit the houses and get the treats? Which neighborhoods give the most candy and have the easiest walking? Back then, adults did not typically participate (other than to give out the candy). They didn’t even go with the kids to do the trick or treating. No worries about safety back then. Now, adults dress up to hand out the candy, have yard parties complete with beer and fires in pits while giving out that candy or, close up the home (i.e. 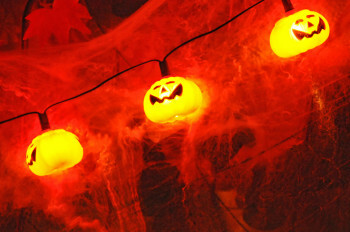 turn the lights out so trick or treaters don’t come) and go out on the town (parties, bars, outdoor celebrations and more). Mary Ann Johnson, the Homeschool Coach collaborates my experiences when she relates her own Halloween memories. It wasn’t until the late 1980’s that Halloween started to overtake other holidays as far as spending and participation goes. My boys were kids in the 1970’s and early 80’s. Their costumes were also typically home made (and put together by the kids themselves). The main changes were that we gave out packaged candy (for this was after the notorious claim of razor blades in apples) and that my husband went with the kids (we didn’t know all of our neighbors) and that some parents had started transporting their kids to prime trick or treat areas. We typically didn’t spend more that $10 – $15 dollars total on Halloween back then. Now the candy alone can cost upwards of $20 even for a small quantity. I don’t remember seeing any haunted houses back then but today you can drop 20 – 50 bucks to be scared penniless in most cities. Halloween parties, if any, back then were pretty simple affairs – with home made decor and a few pumpkin iced sugar cookies for treats and a couple of simple games (like guess which body part this is – passing around peeled grapes in a dark room – to feel like eyeballs). Parties today can be pretty elaborate, with full adult costuming, special Halloween liquor, public event type parties and more. No doubt, children (of all ages) want to enjoy this holiday – who wouldn’t want treats and an escape from the day to day world – a chance to be someone or something else for a night? Just mind your budget as you plan to celebrate – and be safe. But wouldn’t it be interesting to simplify this holiday again – in tune with the simple living movement?